Google, in an effort to provide quick and accurate answers to questions, has been increasing their use of featured snippets over the past few years. In fact, according to research done by Stone Temple Consulting, the volume of rich answers in the SERPs has almost doubled just since last year. Now, some marketers aren't terribly excited about this shift. They wonder why they should optimize their content for featured snippets, since it means users will get the info they need without ever actually visiting the site. What they may not realize, however, is that having your content shown in a featured snippet doesn't necessarily mean less traffic. In fact, research indicates just the opposite is true. Showing up as a featured snippet actually increases traffic to your site (see how one site experienced a whopping 516 percent jump in traffic after getting a featured snippet). Given the potential gains to be had, this post will show you how to optimize your content to give you the best chance of ranking for featured snippets. 1. Identify a common question in your niche or field. Your very first step is to figure out which questions to target. You can use all your usual available strategy to find content ideas...the only difference is you'll specifically be looking for questions. These questions can be as simple or complex as you like. Keep in mind, however, that focusing on extremely simple questions (e.g., "How old is Donald Trump?") is unlikely to result in a ton of traffic to your site. The reason? Users who have already gotten a simple, straightforward answer have no reason to look for additional info on your site. 2. Explicitly ask that question in your content. In terms of SEO, we've gotten away from the one-to-one relationship between keywords and ranking. For general SEO purposes, I rarely even focus on targeting specific keywords anymore, choosing instead to focus more on topics and themes. However, explicitly incorporating your chosen question into your content is important for featured snippets. Be sure to use a question format if at all possible (for instance: "How tall is LeBron James?" rather than just variations like, "LeBron James height."). 3. Use your question in at least one header. Using your keywords in your header tags is a common best practice for SEO. However, it is important for featured snippet optimization too. In their analysis of over 1 million high-CTR URLs, Get Stat found that featured snippet URLs included an exact match query in the tag 21.2 percent more often than regular results. I recommend using your full question (in question format) in your H1 and H2 tags. This is an important practice for getting featured snippets, and also for quickly showing your readers what your page is all about. 4. Provide a clear, concise answer to that question. Short-form content regularly ranks for featured snippets. This means you don't necessarily need to provide in-depth information in order to rank. In fact, research suggests that featured snippet content only contains a 2.2 percent higher word count than regular content. Generally speaking, providing a clear, direct answer to the question is enough. Answer the question directly under your question heading, and keep it to no more than 2-3 sentences. Keep in mind that the average featured snippet is only 54-58 words in length (when shown in the SERPs). If your answer is significantly longer than this, a big chunk of your content will be left out of the snippet. You'll likely want to make sure your page is optimized both for featured snippets ("position zero") as well as for subsequent ranking positions. So, while you may only need short-form content to rank for featured snippets, you'll need longer, more comprehensive content in order to rank for positions, 1, 2, 3, etc. After you've directly answered your question, move on to provide more in-depth information. Use relevant and proof terms, and find related questions you can answer using Google's, "Autocomplete" and "Searches Related to," feature. Many featured snippet pages I've encountered actually contained a much wider range of information than just the main question...so don't be afraid to add content that supplements your primary question. Using ordered and unordered lists within content has now become the norm. It's widely known that lists help readers scan content more quickly, and therefore providing a better user experience. However, research has also found that content that uses numbered lists is more likely to show up in featured snippets. According to Get Stat's research, there was a 41.6 percemt higher rate of ordered lists on featured snippet URLs than on regular URLs. Of course, you can also use unordered lists (bullets). 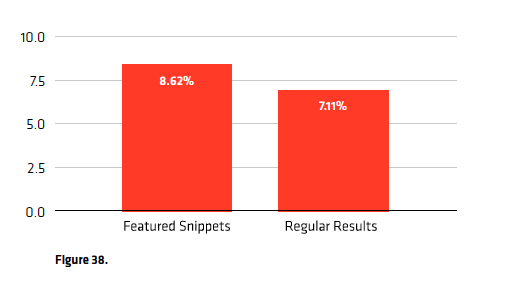 While the research found no difference in the use of unordered lists in regular and featured snippet content, the occurrence was high in both categories: 90 percent occurrence in featured snippets and almost 89 percent for regular results. 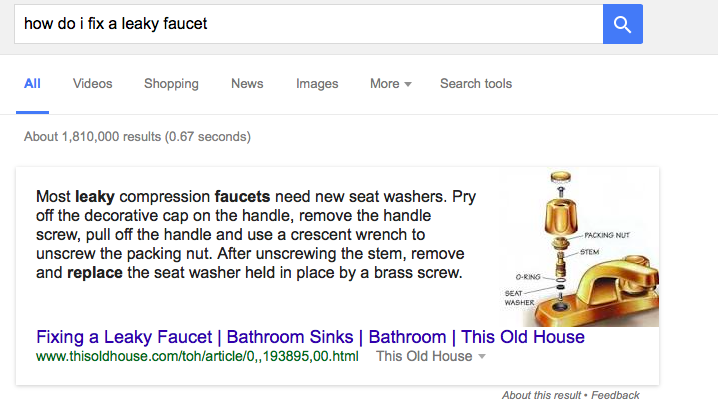 You don't need to hold the first spot in the SERPs in order to rank for featured snippets. In fact, Hubspot found that for keywords where they ranked #1, they only appeared in featured snippets 18 percent of the time. In contrast, for keywords where they ranked #5, they appeared 28 percent of the time. That said, it's unlikely you'll appear in featured snippets if your page ranks lower than 5th...and especially if you're off the first page entirely. Look through your analytics to find pages you can re-optimize for featured snippets. Focus on pages that are already ranking in the top 5 or so spots for related questions or keywords, and use the optimization strategies outlined in this post. I personally was able to do this with my "invoicing" page on my company site. First, I added more content to the page. Seconds, I build a few internal links on higher ranking pages. Third, I then leveraged that page to help others. This increae traffic to this page almost 300 percent. This additionally, helped our organic traffic jump by almost 60 people a day. This may seem small but these are targeted customers that are now coming to may page by something small that I did. 8. Create content around the costs of your products or services. Using the keyword modifier "cost" results in featured snippets more than half the time. Whether you have a product or service-based business or are simply a content publisher, creating content around the costs of various products or services will likely bump your featured snippets. 9. Aim for an 8th-grade reading level. To provide the best user experience, it's important to match your content's reading level with that of your audience. However, for featured snippet optimization, aim for a slightly lower than average level. Featured snippets tend to have slightly easier copy than that of regular URL's. While we're not really sure why this is, they recommend aiming for an 8th-grade reading level. Use a tool like Readability Score to gauge the complexity and reading level of your content. In my content marketing guide I recommend keeping all your blogging at an 8th grader level. This makes it easier to digest for readers. While many featured snippet URL's contain a single question and answer, I regularly see URL's that actually answer a number of related questions. For instance, the featured snippet URL for "What is the coldest planet?" 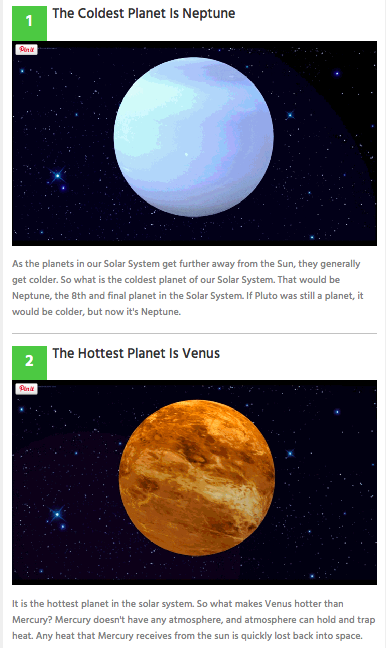 contains the answers to both this question as well as "what is the hottest planet?" (interestingly, the page only shows up for featured snippets for the former). Generally speaking, it's easier to optimize a page for a single question. However, for simple topics it may be preferable to answer a number of questions on the same page. This will make you more likely to rank beyond just featured snippets, as you'll be able to provide more comprehensive, in-depth information.